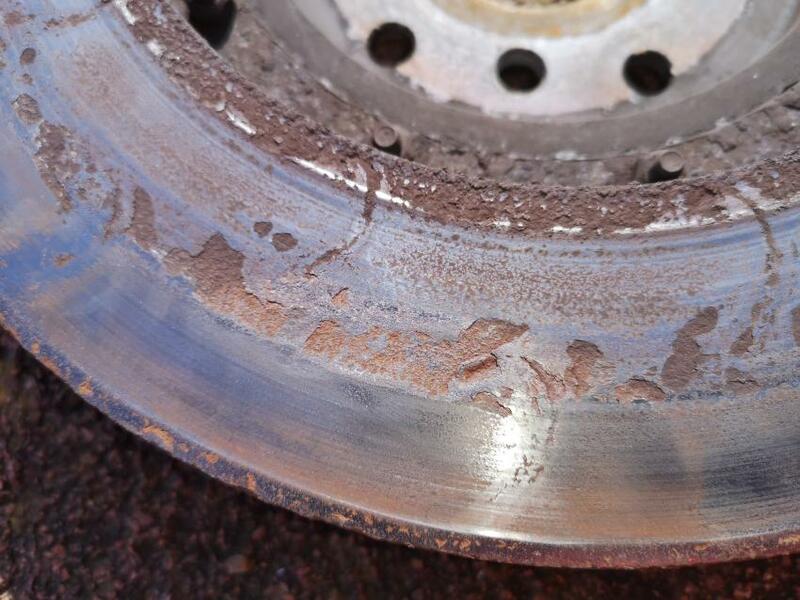 Now I don't know much about anything but I do know that brake discs are supposed to outlast the pads I also know some pads are harder on discs than others. These are the godspeed discs that are on my car at the moment and im looking to get shot of them asap, these are insidious as the problem has occurred on the back of the disc where it is shielded by the dust cover and cannot be seen . The brakes have been noisy / grinding for a few weeks so I decided to take the apart and have a look bearing in mind there is no visual problem when attached to the hub. this is what I found , they are a little over 2 years old and the car has never been driven very hard. 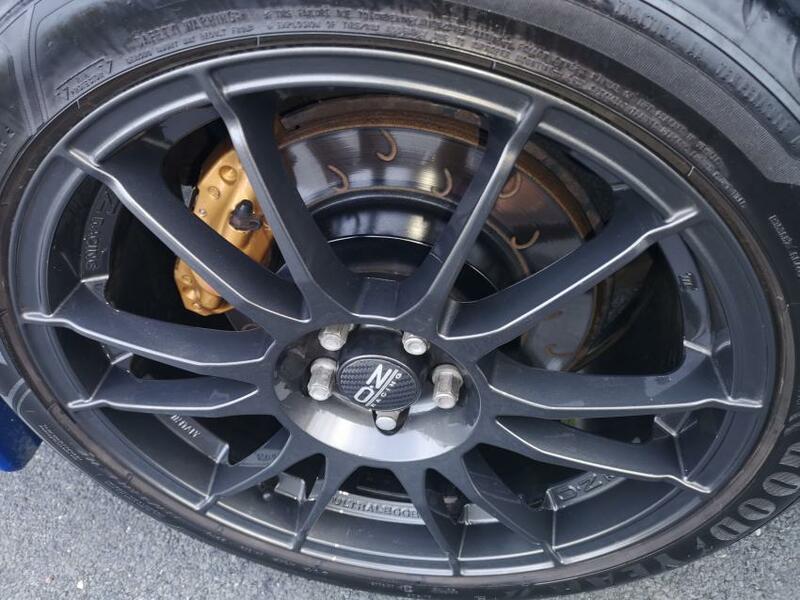 So now im looking for a proper big brake conversion such as AP or Pro Alcon . I have tried AS performance and Sumo but my question is there anyone else I should be looking to buy from. I should have said that the pads still have plenty of meat on them and it was bought as a kit all at the same time . They are shocking. In all my years mucking around cars and bikes, I have never seen anything like that. I wonder if they were manufactured in china or india? Their manufacturing metallurgy can be pretty poor. I have always been a big fan of Brembo discs on bikes and cars, as they always had quality materials. Hopefully still do. Blimey, I thought those Godspeeds were normally decent quality. What was the outer edge like? Could a small rock have got stuck in there at some point? Are these the discs with the J hook grooves on? Seems like a pattern in some of the makings. Yes bud they are the g or j hook . I was warned about these about 3 months after I fitted them by @fpan , this photo was taken after 6 months during a general inspection . I've rarely heard good things about Godspeed. Alyn at AS Performance is the man to go to for brake parts in my experience. I had problems with Godspeed discs too. He just buys in cheap discs (Can't remember the name off the top of my head) and puts them on a CNC machine - sometimes he paints the centre bits which peels off when you remove the wheels the first time too. 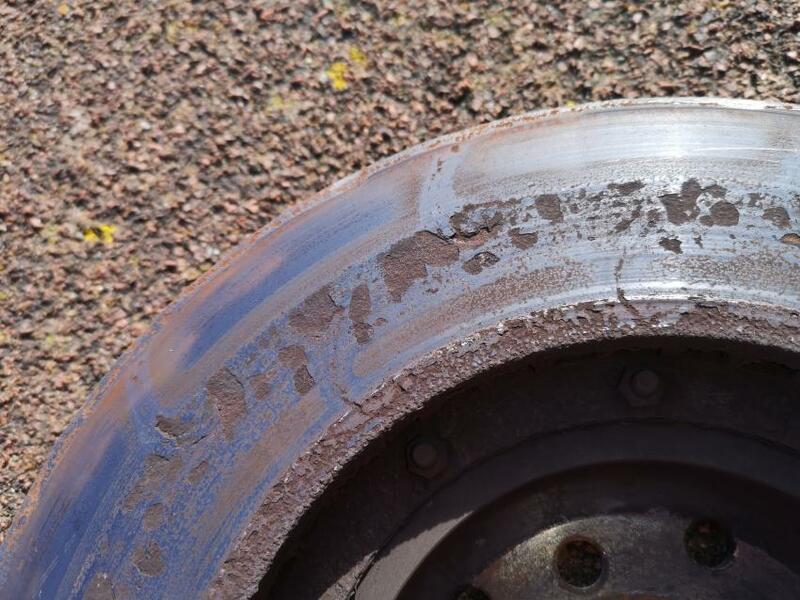 @TMX this also happened to me early on the rear disc started going rusty so I repainted the centre about a year and half ago. this photo was taken yesterday ……. my paint hasn't fallen off . I can't remember how many months this took to happen but it was months rather than years from memory - Not worth being painted really. I can't find the pics I took when I took them off in the end.... Rust was the reason for change, not wearing out. Within 6 months of fitting my SF5 with godspeed J hooks the same thing happened; de-laminated and they warped like a mofo. However the SS pistons they did were sweet as a nut. I've never seen a disc get that sort of damage before either @lockheed - very poor! 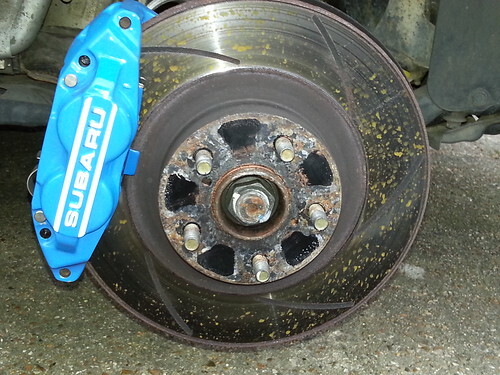 I've been a fan of DBA slotted rotors for many years as they disperse heat and thereby reduce brake fade for off-roading, especially on long steep descents. Stopping grip is also increased considerably over OEM. Endless Racing? Expensive, but as with your entire build, it's high end. @TheRealMrRow . 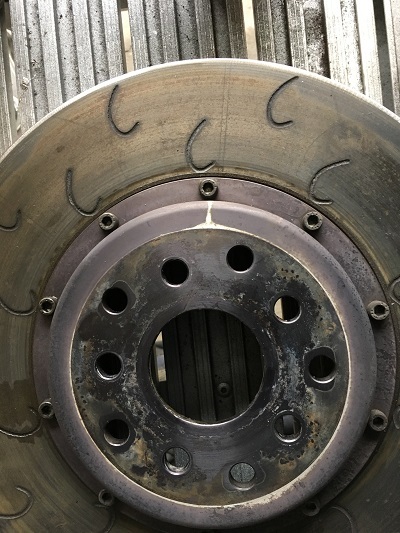 YIKES these brakes look mega just been on their web page however I did notice there were no prices just like lateral performance this means they are probably out of reach for me at the moment . I did get a quote back from Alyn @AS Performance for the AP kit and the Pro Alcon , of course I phoned him straight back after receiving the electronic mail with credit card in hand. Nice one, which ones did you go for in the end? Cheers for your interest @fpan and everyone else . I was hoping to have these fitted for the Pro Drive weekend but it looks unlikely at the moment . I also want to replace the rear discs with PFC single piece discs and the dust covers as they are looking tatty but they are not available from ICP at the moment. fpan and The Hoff like this.